In the summer of 2001, a scientific team directed by the Greek archaeologist Dr. Dora Katsonopoulou, President of the Helike Society, and Dr. Steven Soter at the American Museum of Natural History in New York, discovered the first traces of the Classical Greek city of Helike, destroyed and submerged by an earthquake and tsunami in 373 BC. They also discovered its prehistoric predecessor, an entire Early Bronze Age town, previously unsuspected, and evidently submerged in the same coastal plain some two thousand years earlier. 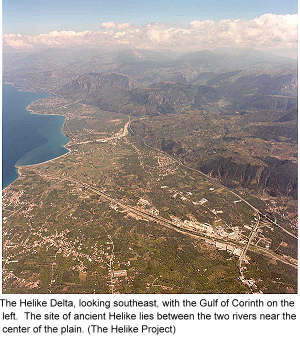 Classical Helike was the principal city of Achaea, in the northern Peloponnesos. It had a venerable pan-Hellenic temple and sanctuary of Helikonian Poseidon, the god of earthquakes and the sea. For centuries after the city was destroyed, ancient writers reported that its submerged ruins could still be seen. Later the site was silted over and lost. Pausanias and Ptolemy had located the site of Helike near the city of Aigion, on the southwest shore of the Gulf of Corinth. Katsonopoulou and Soter began searching for Helike offshore in 1988 by inviting Paul Kronfield to conduct an extensive sonar survey. The results all but ruled out the possibility of a ruined city in the sea. The team concluded that the once submerged site must now lie under the broad coastal delta. They shifted the search to land, by sinking bore holes in the plain to recover sediment cores and by using geophysical methods to search for buried ruins. The bore holes yielded ancient ceramic fragments and other evidence of occupation concentrated in an area of some 2 square kilometers. The geophysical surveys also detected promising targets. In the summer of 2000, when the team obtained a permit to open trial trenches, they had amassed a substantial body of evidence to guide them. In the summer of 2001, the team excavated a trench in the village of Rizomylos to a depth of 3 meters. They discovered demolished walls, pottery fragments, terracotta idols and coins dating from the fourth century BC, buried under a thick layer of clay containing tiny shells of brackish water molluscs. Evidently the site had been submerged by an inland lagoon, which later silted over. Archaeological evidence suggests that the building was destroyed by an earthquake and tsunami. In trenches located about 150 m from the Classical site, at a depth of 3 to 4 meters below ground, the team also discovered a complex of buildings flanking cobbled streets. The rooms contained numerous complete pots of various shapes and sizes, including a drinking cup of Trojan type (depas), all dating from the Early Bronze Age (EHII-IIIA, 2600-2300 BC). The extensive site lies below the water table, buried in anoxic clay containing marine and lagoonal microfauna. The settlement was evidently submerged about two thousand years before a similar fate drowned Classical Helike in the same area. Both the Classical and Early Bronze Age sites are about a kilometer inland from the present shore, among the orchards and vineyards of the village of Rizomylos. In the summer of 2003, the New York-based Helike Foundation raised the funds required to purchase a small field in Rizomylos. This enabled the Helike Project to continue its excavation of the Early Bronze Age site. At a depth of 5 meters, the team then discovered a remarkably well preserved corridor house, which included a store room with dozens of complete pots, some containing bone tools and residues of their organic contents, including seeds. In September 2003, in order to help protect the Classical and Early Bronze Age sites from destruction by a new railroad that would run over them, the World Monuments Fund included Helike in its 2004 List of 100 Most Endangered Sites. World Monuments Fund, 2004 List of 100 Most Endangered Sites. Helike Archaeological Site, Rizomylos and Eliki, Achaia, Greece. BBC Horizon & Discovery Channel (2002). Helike – The Real Atlantis. Henry S. F. Cooper, Jr. (2000). The Road to Ancient Helike. John Noble Wilford (2000). Ruins May be Ancient City Swallowed by Sea.
. New York Times, 2 December 2003. THE HELIKE FOUNDATION: "REVEALING THE GREEK POMPEII"
Page last updated December 28, 2003.